I was out of the office for a few days enjoying a long weekend with two of my cousins, Mariel and Celeste. We had a great time eating our way through New Orleans and enjoying all that the city has to offer. But wouldn't you know it, one of the places we had to stop was a wedding chapel. We spotted the French Quarter Wedding Chapel across the street as we were walking back to our room at The Iberville Suites - which I would highly recommend, by the way. Thinking the chapel was closed, we pressed our little noses against the glass to pear inside, only to be surprised by the approaching owner. He invited us in, told us a little bit about the chapel. 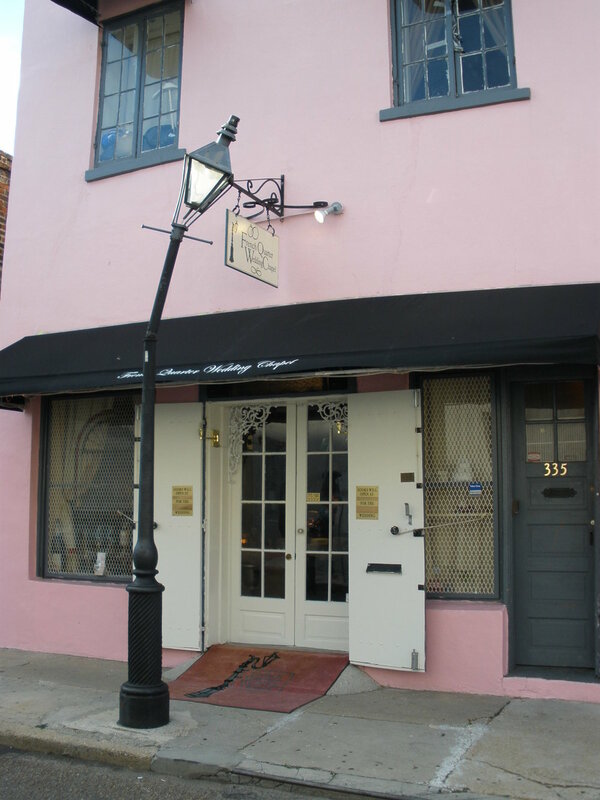 It is the only wedding chapel located in the French Quarter, and is owned by Tony and Lou Ann Talavera. Tony handed me his business card and I laughed when I saw his title: Ambassador of Romance. Here is something that really sets this chapel apart from most: there are dollar bills stapled to their beautiful Cypress-beamed ceiling! Want to know why? You'll have to visit their website to read the story.